- Build on OpenGL technology. 3DChart simply shines on machines with OpenGL accelerated video cards. - Easy and comprehensive and yet powerful object model - no matter what experience you have in charting you will literally be able to create complex charts in hours. With 87 objects containing 557 properties and 442 methods 3DChart is one of the most powerful charting tools available on the market. 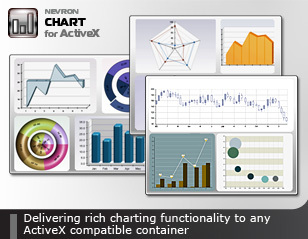 Nevron Chart is the leading charting component for WinForms and ASP.NET. Qweas is providing links to Nevron 3DChart for ActiveX 7.1 as a courtesy, and makes no representations regarding Nevron 3DChart for ActiveX or any other applications or any information related thereto. Any questions, complaints or claims regarding this application Nevron 3DChart for ActiveX 7.1 must be directed to the appropriate software vendor. You may click the publisher link of Nevron 3DChart for ActiveX on the top of this page to get more details about the vendor.